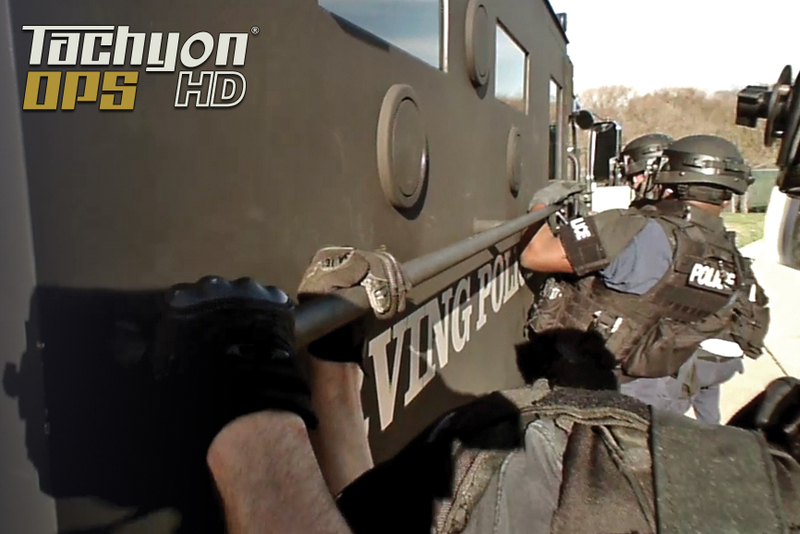 Lewisville, TX — Tachyon, Inc., maker’s of the World’s Toughest Tactical Cameras, is extending the company’s T & E program for law enforcement personnel to include agencies worldwide. 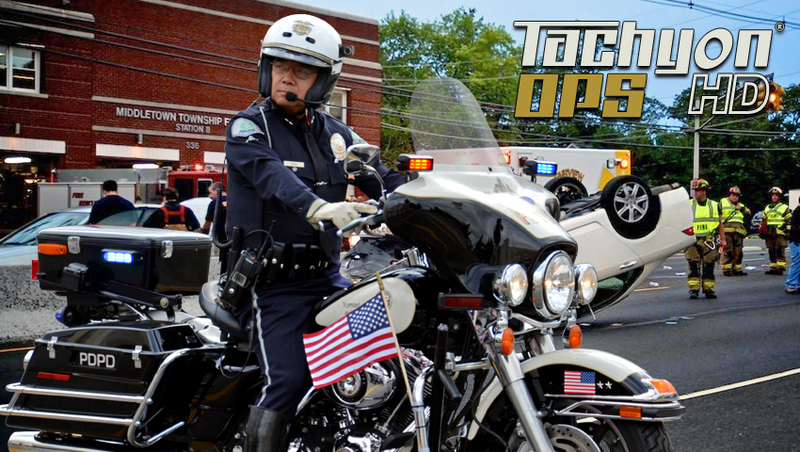 After receiving positive feedback from United States law enforcement communities, Tachyon has decided to invite agencies around the world to join in on this great opportunity to test out the Tachyon tactical police cameras on the job to see how they would best fit with the departments needs. Law enforcement agencies today face many hurdles while trying to protect and serve the citizens. Lack of manpower, lack of funds, and lack or equipment are just a few. The Tachyon line of tactical cameras can solve a lot of those issues because these cost-effective cameras are built with the needs and budgets of the law enforcement community in mind. And by capturing time-stamped, officer-perspective video and sound of events as they unfold, Tachyon tactical cameras may reduce dramatically the number of false complaints and lawsuits directed at the department. Whether attached to an officer’s cap, mounted on the dashboard of a cruiser, or on a SWAT unit’s helmets or guns, officers will be able to see the versatility and durability of these lightweight, tough, little cameras. 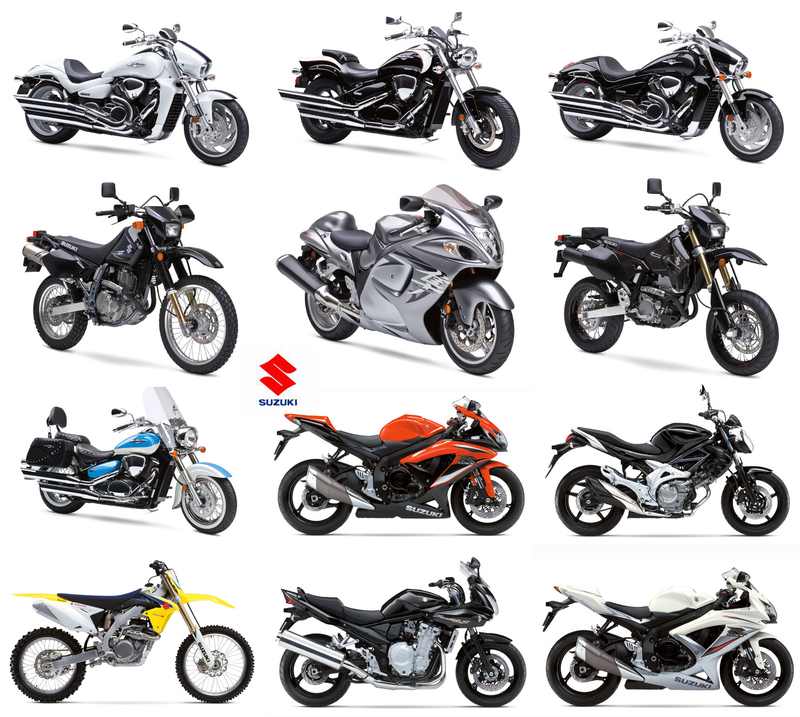 Please follow this link to check out the cameras and accessories. Just select the items the department would like to evaluate and Tachyon will ship them out to test for 30 days. At the end of the 30 days, the department can decide to return them or purchase them. 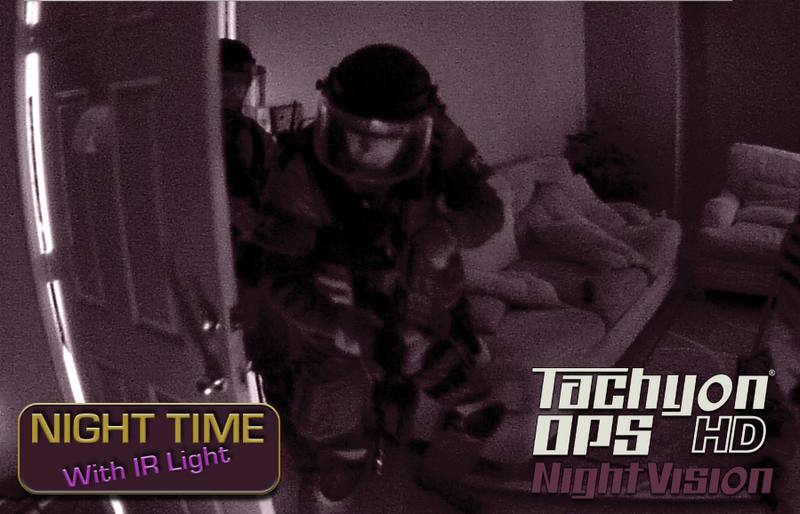 The Tachyon OPS HD and OPS HD Night Vision police tactical cameras should meet every departments needs – tough, compact, and cost-effective cameras that will record in quality HD video with crystal-clear audio. The current date and time is stamped on every video and photo to aid in documenting different activities. These camera provides over four hours of recording time on a single charge of its rechargeable battery, and can easily be recharged from any laptop or computer. Tachyon also offers the Charge n’ Record charger which, when used with a 12V source, gives unlimited power on the go. For recharging indoors, Tachyon offers a 110-240V charger. Unlimited recording time is assured with the continuous looping technology that automatically records over the oldest data. When using a 32GB memory card, the camera will get over eight hours of data before the card is full and data starts being recorded over. 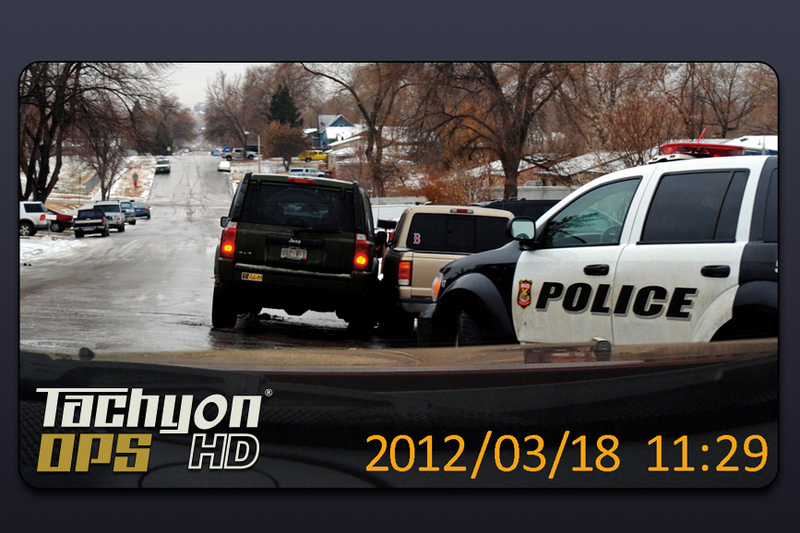 This makes Tachyon tactical helmet cameras an excellent choice as dash cameras or motorcycle cameras. With a weight of only 1.2 oz, the camera is hardly noticeable and doesn’t get in the way of the job. And with the patented 8-direction mounting system, the mounting options are virtually unlimited. These Tachyon cameras have one-button operation that starts and stops recording. This allows for easy operation even while wearing heavy gloves and gear. Whether taking video or time-lapse photos, the camera picks up all the action with the 125 degree field of vision and with little fish-eye effect. All files are saved on the micro memory card and can easily be transferred to a hard drive for playback and storage. Included in the box with the cameras are a Rainproof Cover, a Contour Mount (for mounting as a helmet camera, shield camera or dash camera), a Tripod Mount for attaching to a ¼ 20 inch tripod screw, a Clip Mount for clipping the camera to just about anything, including caps and vests. Optional accessories include the Quick-Release Handlebar Mount, which can be easily mounted on a police motorcycle or police bicycle, the Picatinny Rail Mount for mounting the camera to any type of gun or helmet with a Picatinny rail. Along with this, Tachyon offers GunCam rails for mounting the cameras, inside the Picatinny Rail Mount, to rifles, shotguns, handguns, and scopes. And for power, there is the 12V and 110-240V Charge n’ Record Chargers, which enable the camera to get continuous power for loop recording. Lewisville, TX based Tachyon Inc., is the premier innovator of durable law-enforcement, military, and extreme-sports helmet cameras. Ease-of-use, durability, recording time, and quality make Tachyon the trusted and go-to helmet camera source for those who demand the best for their demanding jobs. Tachyon, Inc. is an accredited member of the Better Business Bureau, the NSSF and the NRA.